Lisa and I met while attending Marshall University. I met her on campus and invited her to go whitewater rafting with me on the New River where I was working as a river guide. 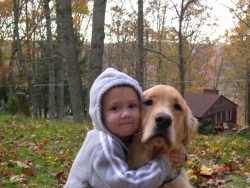 After that, we were inseparable. I graduated from MU with a degree in Business Management. I left WV and moved to Atlanta, GA accepting a position with a fortune 500 company. Soon after I asked Lisa to marry me, she too left our beloved state and joined me in GA for 4 years. 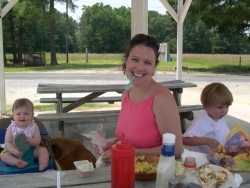 Lisa worked as a Nurse Practitioner. 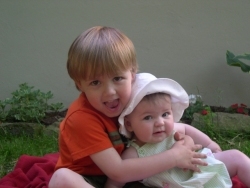 After the birth of our 1st child, a son named Bode, the homesick feeling we already suffered continued to grow. After thinking long and hard we made a mutual decision to move back home. Although we would be giving up financial security we felt it was worth more to be home. 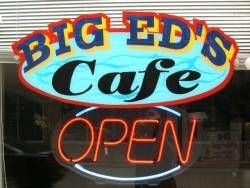 My Dad, Eddie Queen, had been running a lunch joint called “Big Ed’s Café”. After hearing of our wishes to come home he generously offered to turn ownership over to us. We agreed and that is how Swiftwater Café came about. Since 2003 we have been striving to make continual improvements, while providing the Downtown Charleston area with quality breakfast and lunch options. Our wishes are to offer our customers friendly, fast service, while setting new standards for quality and customer service downtown. At the same time we also want to share our love of West Virginia and the swiftwater rivers in our state. My staff and I work long hard hours to provide service Monday-Friday while my wife works as nurse practitioner. Any free time we have, we spend it on a piece of land we own on Beauty Mountain by the New River where we started our life together. We are building our future one lunch at a time. Looking for a delicious BLT? You found it. Stop in and make it a meal with chips & a drink! Doesn't it feel great when someone treats you to lunch? Administrative Professionals Day is April 24th - show your appreciation with a Swiftwater Catered Lunch! Monday is back, and with it our Swiftwater Lemon Pepper Chicken special! Comes with your choice of side and a fountain drink. It is National Grilled Cheese Day! Celebrate with our Swiftwater Italian Grilled Cheese Sandwich with pesto, tomato and a balsamic reduction. Our Thursday Special is our Swiftwater Reuben! Eat in or take it to-go, we promise you can't go wrong. Happy Monday! We've got our Grilled Chicken Sandwich Special today which comes with your your choice of side & a drink. The sun is out and our special is Pizza Grilled Cheese. Stop by at lunch and enjoy a great lunch to go with this sunny day! Happy Monday! We’ve got our Swiftwater Grilled Chicken Quesadilla on Special today! We've got that Friday feeling, the sun is out and we've got our Big Ed Burger Special! Our Monday special is our Swiftwater Grilled Chicken Sandwich! It comes with your choice of side: red potato salad, pasta salad or chips and a drink. Happy Friday! Our Friday Special is always our Big Ed Burger, but for those customers who are looking for a meat-less option - we recommend our delicious Italian Grilled Cheese! Our Thursday special is our Swiftwater Oven Gold Turkey Sandwich on toasted semolina bread with lettuce, tomato and a homemade pesto ranch. The special comes with your choice of side and a drink. Happy First Day of Spring! Stop by to enjoy our Big Ed Burger Special, which comes with roasted red potatoes or baked fries and drink. Lunch plans fall through? Need something quick? Stop by our Grab N' Go Cooler for a fresh Cobb Salad or a delicious deli wrap. We've got plenty of options for your lunch on the run. Happy Monday! Stop in today for our Swiftwater Chicken Philly Special - comes with a side a drink. Happy Friday! Stop by for our Big Ed Burger Special! We're gonna keep it simple today - it's beautiful outside and we have our meatball subs on special ? If you're looking for a walk in the sunshine and a delicious lunch, come see us! We all have our favorite go-to items on the menu - but when was the last time you tried something different? Jump out of your lunch-time comfort zone and try our delicious Pesto Turkey Sandwich! It's Monday - which means we have our Grilled Chicken Sandwich Special! Comes with your choice of side: red potato salad, Swiftwater pasta salad, creamy coleslaw or chips and a drink.